Earlier today, Google launched its eBook store with 3 million books, many of them free. I’ve been playing around with it on my iPad even though there is no iPad app yet. That is because you can read the books in your browser. iPad and Android apps are available, but if Google can make the browser reading experience just as compelling, people won’t need those apps. So far, however, the in-browser reader is a disappointment. 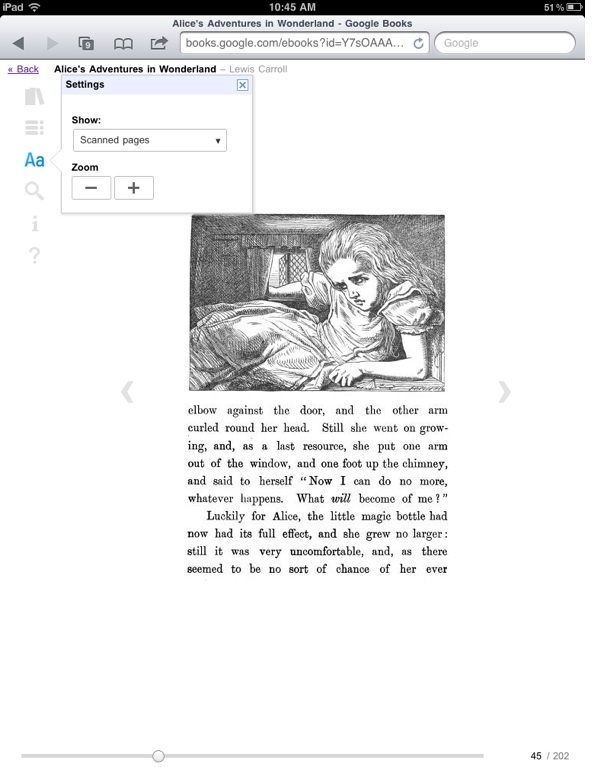 When you log into Google eBooks via the browser, your shelf is filled with three free eBooks: Alice’s Adventures in Wonderland, Great Expectations, and Pride and Prejudice. You can read them in your browser on your iPad, on your phone, or on your laptop. One of the best features of Google eBooks is that it remembers your place and starts you where you left off the next time you load the same book. It is also supposed to sync between devices, so that you can start reading on your laptop, pick up on your phone, and then finish off at night on a tablet. While this bookmarking feature seems to work fine within any given device, I find the syncing only works about half the time between devices. Half the time, it seems to cache the last page read on whatever device you are reading on instead. There is no way to manually set a bookmark in the browser reader either. The HTML reader is basic but functional. On an iPad, you can read one page at a time vertically, or two pages horizontally. It lets you choose different fonts, and even read the original scanned version of the book (see screenshots below comparing the scanned version to the “flowing text” version). Google eBooks also maintains the orignal pagination as best it can, which is much better than the random-seeming “location” numbers you find on a Kindle. But there are no page-turning animations like you get in Apple’s iBooks app. That may sound like a trivial nitpick, but that swiping animation is one of those details which make digital books a pleasure to read in iBooks (my children fight over who is going to turn the next page when I read them the Winnie-the-Pooh book that comes with the Apple digital reading app). 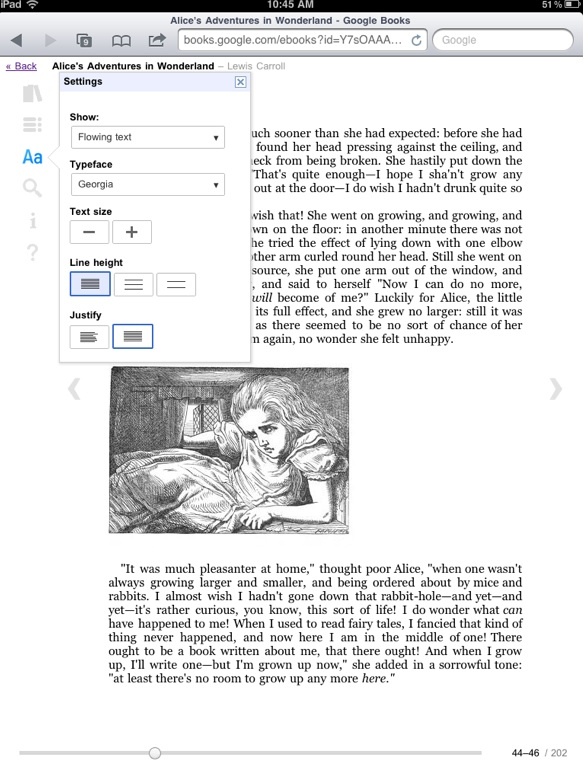 Unlike the browser version, the Google eBooks iPad app does include page-turning animations.